Kazimierz, which lies to the south of the Royal Castle, was once a town in its own right. With its labyrinthine streets and low-standing houses, it feels like a different world to the Old Town, and indeed, you may well get lost here. However, this is not a bad thing, but very much part of the whole experience. The town was founded in 1335 by King Kazimierz the Great, and as its splendid churches and synagogues evoke, it was once a world of prosperity and tolerance. Yet, despite having set sail on such promising waters, the district was not to have an easy journey. After many ups and downs, the death-knell for Jewish Cracow was sounded in September 1939 with the Nazi invasion. A whole world was swept away. As recently as the year 2000 much of Kazimierz was still in ruins, a crumbling shell of its former self. Numerous houses, which initially gave the appearance of a squatters' paradise were, on closer inspection, unfit even for mice, since whole floors had collapsed, rendering many areas highly dangerous. Kazimierz was known as a dirty, not altogether safe place, inhabited by stray dogs and morose alcoholics. And to add to this there was the highly emotive issue of land repatriation. Today, out of the blue, Kazimierz is undergoing a major renaissance. Both its Jewish and Christian heritage is being restored, and colour has returned to its alleys and squares. Just wandering about is an experience in itself, but not to be missed are the Corpus Christi Church, the Tempel Synagogue and ulica Szeroka - the heart of the old Jewish district. Either of the two cemeteries, the Remuh or the New, are also well worth a look. And of the more recent arrivals the Galicia Museum deserves a special mention. All this is to say nothing of the many bars and cafes which are springing up by the dozen. For in an unexpected twist, it's in Kazimierz that you'll find 'the dopest joints in town' if we can slip into P Diddy parlance. A handful of these are really quite special. Kazimierz is an enchanting place, and a place to reflect on what has gone before us. Krakow has many wonderful places, but I love Kazimierz best of all. It combines the leading edge of the development of the young, artistic, craft-based, eating & drinking places (just watch the wiring - you don't want to get electrocuted by the often terrifying amateur efforts! ), with the recently renovated old buildings and the poignant sadness of the remaining Jewish structures. The people seem to be especially friendly & many speak English (and other languages). It is good value and we can get in on the ground floor of its resurgence. If you like to eat out there is only one big problem: how to choose from the plethora of establishments that you'd love to try. I'd say go for one of the kosher places for an authentic meal with enteratining staff, obviously at least one classic Polish main meal, and if you are walking through the market square at night the round building in the centre has a few 'take-aways' selling a ciabatta-like base with your choice of topping - now a staple food in my own home. If you drink alcohol, I would go for the more unusual places, such as the bar that sells every type of Bols, and dozens of types of home-steeped vodka (eg you will see a bottle with chillis in it) - this is now another idea we have copied at home. Or enjoy wandering, stopping off for coffee or something stronger at one of the many fascinating bars. Do not miss Jozefa (a street of little shops that leads up to the square - they got together to make a free cartoon map of the street which is useful & a nice reminder). It is also pleasant to cross the footbridge over the Vistula & see it from a different perspective as you drink your piwo or kawa, maybe with a dish of pierogi. I need to go back right now, so please follow in my footsteps! ONLY WARNING: the transport security people are a scandalous shame of Krakow - always buy a ticket BEFORE getting on, you then stamp it on the bus to show when it is activated. Full of atmosphere, and great nightlife. Actually, preferred it to the Old Town, which is a bit touristy. be sure to choose a guided tour so you can see much more than their own. be sure to explore the old town. in the old town you can find the desired guide, there will be cheaper than a hotel or through the Internet. necessarily need to go to the salt mines. 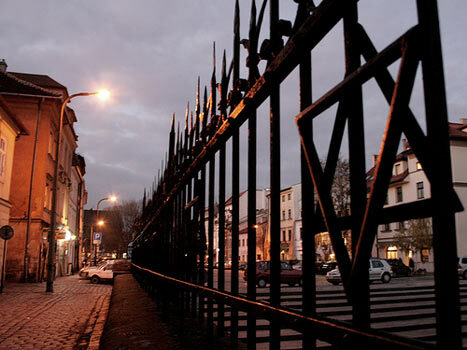 Kazimierz, the area is rich in history by day and by night an active life. We went to Kazimierz in May and was amazed at what we saw. The best part was the Jewish restaurants with the wonderful food and music. We are planning another trip for next year. I found Kazimierz to be the most interesting (for me, anyway) part of Krakow, and spent most of my time here last week during a 5 day holiday. Having just returned from a trip to Krakow, we stayed at a superb appartment in Kazimierz which was very cheap. I was in awe of this beautiful place so steeped in history. They are working hard at rebuilding/ conserving the older derelict property. The atmosphere was wonderful as were the people. I will certainly go back to soak up some more history of those poor poor people who must have suffered beyond comprehension. What happened there must never be forgotton. The history of the holocaust should be taught in schools world wide. Magnificient chu Magnificient craig regsrdlreds of the city wolud.judt eoul to sdsinl out. Everythig is going easy provideg You have got locsl gusrd. I think more people should visit beautiful places like Kazimierz, it makes you realise how precious life is. It is only a small area of Krakow which in a way is a bit run down, but please don't let that put you off,it really does add to the atmosphere of the whole area and one that the visitor must savour. From what I can see it is returning to its old Jewish enviroment, which at one time was so abundant there but was so sadly taken away from the people who lived and worked in the area.I went for a meal at the Ariel restaurant in the Square,and it was wonderful. Jewish cuisine and music which probably happened before the WWII and then world came crashing down for no apparent reason only that they were Jewish. I'm Jewish and for the life of me I can not understand the reasons for this mass murder, it really is beyond comprehension. I will say only one more thing and that is go to Krakow and Kazimierz and try to take in why a small suburb like this, a happy and vibrant suburb, should be subjected to such atrocities. For the love of God it must never happen again for our childrens sakes. Bless you all who read this. I went to Kazmierz in 2008 and I went to the Remuh Synagogue, being Jewish, and it has an atmosphere that is second to none.You go back in time,as you should, but unfortunately it seems to stop at 1939, and you can envisage the horror what must have occurred there. I went to the museum that is there, where apparently Oscar Schindler appeared and tried his utmost to save Jews. He was a remarkable man like many others who tried to save us. I am about to visit Krakow for the 3rd time in 12 months (I go again in March). I love this place. I have stayed in both the Old Town and Kazimierz. I prefer to stay in the Kazimierz district. The bars and retuarants seem to be cheaper here and busier and cater for all tastes. I prefer evenings in kazimierz and then making the 10 minute stroll to the old town for wondering around in the daytime. We visited Kazimierz in July 2007. On a souls searching trip to Auschwitz. We walked from Krakow to Kazimierz and it was well worth the walk. A lovely old town so full of history, visited the cemetary very very old and beautifull, be warned scull caps to be worn and legs to be covered.Stopped in a bar and was pricey but again well worth it just to sit in the square and take it all in. We then walked to the Oscar Shindler factory so much to see and not enough time, I will visit the jewish Quarter next time . But fantastic trip and will be returning in July 08. We had a great weekend in Kazimierz early June staying in the Hotel Kazimierz on Miodowa. Loved wandering the city and taking in the way of life of the normal person, enjoying the wide diversity of foods. Soaking up the history and trying to imagine what life was like during the war.We wil be back sometime in the not too distant future hopefully. Your website is very good.